You like this – I have a suggestion and a question for you. First, I appreciate all the information in your previous post, but don’t you think it was a little long? I mean, I imagine at some point people stop reading and just start skimming. Maybe next time you can give us the abridged version? 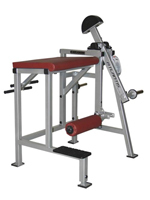 Anyway, my question is, with all the broken down equipment in the gym you described, are there perhaps any newer pieces of equipment that you’ve actually like? Curious, ummm, that post was the abridged version. I didn’t even get into which brands consistently underperform, the work-arounds for various body parts, my dream of becoming a buyer for a wholesale fresh fruit company … you get the idea. For whatever it’s worth, I think there are lots of spectacular new machines out there, but for some reason they’re all showing up in gyms only in Las Vegas or Southern California. I just drool over the photos in the muscle magazines – not over the bodybuilders of course (not that there’s anything wrong with that …) – but over these fantasy-camp gyms where the photo shoots take place. On the left is Atlantis Strength Equipment’s reverse hyper extension. You lean over the top pad, grab the handles (far left) and slide your calves under the low pad. By lifting up with your low back and hamstrings, you work your core through a very advanced move without subjecting your low back to the risky mechanics of a deadlift or squat. Until recently, the reverse hyper extension could only be performed by hanging awkwardly from a roman chair … this is the real deal. 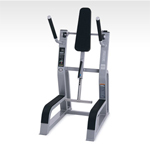 The machine on the right is Precor’s v-crunch machine for the lower abdominals. Various pieces of equipment exist that position your body the same way. But by stepping onto the v-crunch’s footrest, the machine forces you to lift in perfect form, creating a targeted burn in the normally difficult-to-isolate low ab area. I found the Atlantis machine at a gym in Florida, the v-crunch in Northern Virginia. But at my fantasy camp, they’re both in the same place. This entry was posted on Monday, February 12th, 2007 at 7:35 pm and is filed under Gyms. You can follow any responses to this entry through the RSS 2.0 feed. Both comments and pings are currently closed.